Dance Academy: Arts Education supports Middle Years educators with engaging classroom activities, designed to enhance students’ knowledge, skills and understanding of dance, as both an artist and audience. 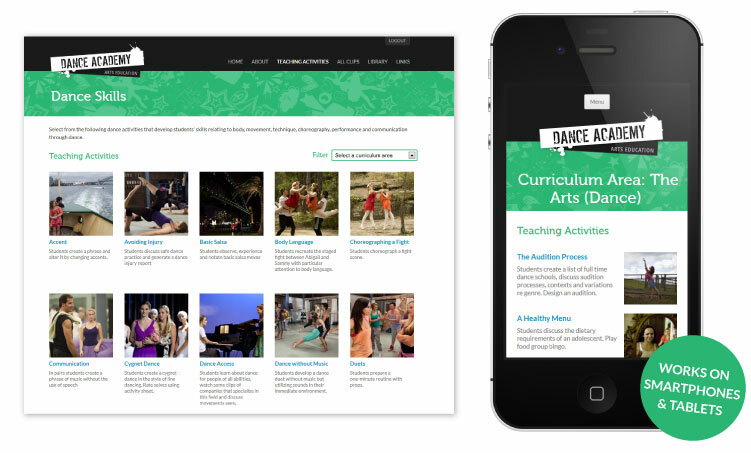 The website features video clips and production materials from the award-winning television series Dance Academy, stimulus for over 100 downloadable teaching activities that have been aligned with the Australian Curriculum areas of The Arts (Dance, Drama, Media, and Visual), English and Health and Physical Education (Personal Development). Each activity provides educators with a contemporary approach to exploring elements of The Arts within their classroom, matched with printable student activity sheets and links to additional support materials – including instructional video clips and fact sheets developed by Ausdance. Dance Skills – explores body, movement, technique, choreography, performance and communication through dance. Dance Knowledge – explores genre, culture, history and styles of dance; safe dance practices; dance processes; and dance vocabulary. Health and Wellbeing - explores health, fitness, human movement, nutrition, personal development and identity. Production - explores stagecraft, costume, lighting, design, event management and technology and innovation within dance production. For a complete listing of all teaching activities and their related Curriculum areas and Themes, download the Teaching Activities Overview. A sample activity, Free Form, is available to view in The Learning Centre of the ACTF website. For more information about the Dance Academy television series, visit the ACTF’s Education website. A login for the Dance Academy: Arts Education website is provided with any Dance Academy DVD purchase from the ACTF Education Catalogue – via the ACTF Shop or through an authorised ACTF education reseller. Please enter the Username and Password codes, located on the DVD box cover, into the Log In page to unlock all sections of the website. If you experience any problems accessing these materials, please contact us with your proof of purchase to obtain assistance or replacement authorisation details.